The Georgia General Assembly created the county of Cass (now Bartow County) in the year 1832. The General Assembly, in December of 1833, passed the following: "An Act to to make permanent the site of the public buildings in the county of Cass, at the town of Cassville, to incorporate the same, and appoint commissioners thereof. Cassville was the focus of the development of northwest Georgia. The opening volley of Lincoln's war came at a time when Cassville was the most prominent town in north Georgia. There were hotels, merchants, churches, a tailor, a wagon maker, and two Colleges. Offices of lawyers were around the courthouse square. When Cassville was burned at the hands of Sherman's troops in 1864, most of the men were away. In that bitterly cold November, women and children came together and survived through sheer courage. After the war, most of the professionals moved their offices and homes to Cartersville, which had become the County Seat. Those few families staying in Cassville were early settlers, with substantial real estate. They became the nucleus of the town. After the war there were teachers, a doctor, ministers, and well to do planters. Cassville gave the County several elected officials, such as a tax collector, and a sheriff, among others. Cassville has a Confederate Cemetery with some 300 graves. Cassville has the oldest continuous Post Office in Georgia. It is on the National Register of Landmarks. It's now the Cassville Museum. On the left is William Davis "Dave" Pittard (1861-? ), who ran the general store in Cassville, and on the right, his brother, James Dillard "Jim" Pittard (1867-? 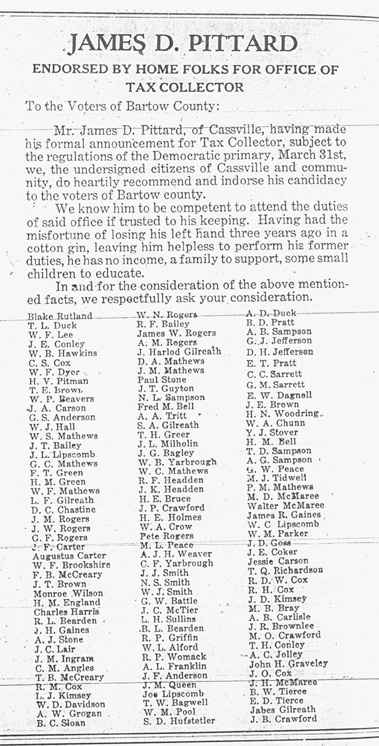 ), Bartow County Tax Collector. Though fairly well concealed, you can still make out that Jim is missing a hand, the casualty of a farming accident. In the political ad below, he used the loss of his hand to appeal for votes! From the cars I would guess this photo was made in the 20s. 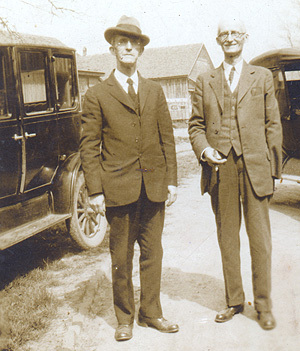 Dave and Jim were Kay Borden's great grandmother's brothers. This ad ran in the March 25, 1920 edition of The Tribune-News. The Cassville Heritage Association was organized to honor the memory of the stalwart and enterprising citizens of Cassville, those before the Civil War, and those after. There are four business meetings per year, some with guest speakers. Meetings are held in the Heritage Room, in the old Cassville Bank Building. The building is next to the fire station, and across the street from the courthouse square marker. The Adopt-a-Monument program for restoration of a family or favorite headstone. Individuals may sign a form and receive assistance in locating suitable craftsmen. Cost is borne by the individual. During the year, one restoration project is sponsored by the Cassville Heritage Association. Eleanor Thomasson was the originator of the Cassville Heritage Association. The first meeting was held May 23, 1993 in the sanctuary of the Cassville United Methodist Church. The charter members were: Eleanor and Edwin Thomasson, Herman Bearden, Doris Matthews, Joel Kimsey, and Thomas and Emily Champion. At this first meeting, Herman Bearden was elected President, and Joel Kimsey was elected Secretary/Treasurer. Walking through old Cassville today, one would find very few remains of the thriving city which once existed before Sherman's Army burned and destroyed everything for miles around. Although in many ways it still resembles the layout of the former town, Cassville was never rebuilt as an incorporated town and the businesses never returned. Today, only three churches occupy the same ground they once did. The town that sat in the midst of Cherokee Georgia and served as the county seat of Cass County survives no more. Cassville was also the home of the only newspaper for miles around, The Cassville Standard. The first issue of The Standard was published March 15, 1849, and continued up until the town's destruction. The Standard was the last in a line of newspapers published in Cassville. In 1859 the stockholders in The Standard were Joseph Chapmon, Thomas M. Compton, William Latimore, William Headden, M. McMurray, arid Jesse R. Wikle who came from the Dahlonega Watchman and bought an interest in the paper. When Cassville was burned in 1864 The Standard offices were destroyed and the state acclaimed newspaper was lost forever. The only surviving copies are at the Library of the University of Georgia.3 Once the confusion and destruction of the town were over, a newspaper appeared in nearby Cartersville under the name of the Cartersville Standard and Express, but this was only namesake. Click on map for a larger map. Map copied from a drawing by Joe Mahan which appeared in the Tribune News, Cartersville, Thursday, November 2, 1939. The majority of Sherman's Army came into Cassville from the northeast and arrived during the night of May 18th. It should be remembered that the fragments of the Army of the Tennessee that were in Kingston were cut off from Cassville at this point and never were able to get to Cassville.17 The discovery of Johnston's Army in Cassville came about as a stroke of luck and there is no way of really telling what the outcome Would have been if Sherman had wasted his time attacking Kingston. One thing is for sure though, Butterfield's discovery saved McPherson's troops in Kingston because the Army in Cassville could have never arrived in Kingston in time to bailout the Tennesseans. There have been several historians who have written about Sherman's famous "March to the Sea." Almost all of these begin with the siege of Atlanta and follow it from that point on. It was here, they claim, that Sherman decided that "War is Hell" and from that point on total destruction and foraging took place. Still there have been others who claim that Sherman's change in thinking about war came at a spot he referred to in his Memoirs as "Hell Hole." Actually this was New Hope Church, near Dallas, Georgia.25 In opposition, I feel that his change in thinking must have begun at Cassville. After all, it was Cassville which suffered the torture of being burned and Cassville was the spot Joseph Johnston had chosen to entrench and fight. New Hope Church was ground of Sherman's choosing. Therefore, the orders to burn Cassville possibly came in celebration of victory over Johnston on his own ground. Cassville was the victim of fire, not New Hope Church. The three churches which still are on the same grounds and three residences were the only structures left standing by Sherman's Army. The home of Dr. Weston Hardy served as a hospital and was not burned for that reason. The Mercer home also, was spared because of sickness. Tradition has it, the home of Mr. A. C. Day was saved when the captain saw a certain Masonic emblem as it dropped from a bible while the family brought out their furniture.30 These three homes and the Baptist, Methodist, and Presbyterian churches were unharmed. It was this railroad that ended any possibility of rebuilding Cassville. Cassville could only be reached by horse or stagecoach, while Cartersville was a major rail center. It is for this reason that Cassville today is only a small community consisting of the three old churches, a store, a post office, a new fire station, an empty courthouse square, and a Confederate Cemetery. 1 Georgia Historical Society marker at the site of old courthouse square. 2 Headden, Delle, "The Cassville Schools," November 24, 1954, p. 1. (This was a 12 page paper found within the scrapbooks which was done with most of the information coming from a book entitled, Bartow County Georgia History. 3 Ibid., pp. 1, 2, and 4. 4 Mahan, Joe, "Cassville Destroyed Seventy-Five YearsAgo:"TheTrlbuneNews, Cartersville, Ga., Thursday, November 2, 1939. 5 Headden paper, pp. 2 and 3, and Georgia Historical Society marker'at the site of the Girls Methodist College. 6 Headden paper, pp. 2 and 3, and Georgia Historical Society marker at the site of the Cherokee Boys College. 7 Headden paper, p. 3. 9 Mahan, Joe, p. 2. 10 Georgia Historical Society marker at courthouse square and Headden paper, p. 2. 11 From a Memorial Day program held at the Cassville Confederate Cemetery in 1963. 12 From observation at the Cassville Confederate Cemetery which is located just behind the Methodist Church on a hill east of Cassville. 13 Spencer, Thomas, "Memorial Day at Cass," The Weekly Tribune News, Cartersville, Ga., Thursday, May 16, 1963, p. 2. 14 Spencer, Thomas, The Weekly Tribune News, Cartersville, Ga., Thursday, May 27, 1948. 16 Georgia Historical Society marker North of Cassville. 17 Spencer, Thomas, May 27, 1948. 20 Spencer, Thomas, "William N. McKelvey Home Called Most Historic Spot In Bartow," The Tribune, Cartersville, Ga., Thursday, June 17, 1948, p. 1. 21 Georgia Historical Society marker at ridge just south of Cassville on Wilson residence. 22 Perkerson, Medora Field, White Columns In Georgia, pp. 201-202. 23 Spencer, Thomas, May 16, 1963, p. 2. 24 Spencer, Thomas, "Looking 'Em Over," The Tribune News, Cartersville, Ga., August 4, 1948, p. 5. 26 Mahan, Joe, p. 2. 30 Mahan, Joe, p. 2. 32 From 1869 issues of the Cartersville Standard and Express. 33 From an advertisement in the Thursday, May 27, 1875 issue of the Cartersville Standard and Express, p. 3. In addition to the specific listings made below, it should also be mentioned that I made an overall survey of many collections of newspapers from 1869 to 1900 published in Cartersville. Ms. Delle Headden's three scrapbooks were also extremely helpful and contained at least leads into the information I was able to gather. Also, a portion of the information assembled came via historical markers placed strategically throughout old Cassville and Cass Station during the 1950's by the Georgia Historical Society, the U. S. Department of the Interior, and the Patriots of Bartow County. Headden, Delle. "The Cassville Schools," November 24, 1954. Long, E. B. The Civil War Day by Day, An Almanac 1861 - 1865, Garden City, New York, Double Day and Company, Inc., 1971. Mahan, Joe. "Cassville Destroyed Seventy-Five Years Ago," The Weekly Tribune News, Cartersville, Ga., Thursday, November 2, 1939. Marschalk, W. A. and A. Marschalk, ed. The Standard and Express, Cartersville, Ga., Thursday, May 27, 1875. Perkerson, Medora Field. White Columns In Georgia, New York, Bonanza Books, 1955. Spencer, Thomas. Article within The Weekly Tribune News, Cartersville, Ga., Thursday, May 27, 1948, p. 2. Spencer, Thomas. "Memorial Day at Cass," The Weekly Tribune News, Cartersville, Ga., Thursday, May 16, 1963, p. 2. Spencer, Thomas. "William N. McKelvey Home Called Most Historic Spot In Bartow, " The Tribune News, Cartersville, Ga., Thursday, June 17, 1948, p. 1. Spencer, Thomas. "Looking 'Em Over," The Tribune News, Cartersville, Ga., August 4, 1948, p. 5. Cassville was once a beautiful and attractive village situated within a little less than three miles of the W. & A. Railroad, north of Cass Station, near the center of Bartow County; but happening to be directly in Sherman's war-path, it was shorn of its glory and laid in ashes by the federal Torch. Various reasons are assigned for the cruel deed. Some said it was on account of the name of the place being changed by our legislators from Cassville to Manassas, soon after the battle of Bull Run; others said it was done in revenge for the waving of a black flag at Cass Station by two young ladies whose patriotism was greater than their prudence. Again it was said that being so near the railroad it was a harbor for the rebel scouts. The Federals entered Cassville on the night of May 19th 1864, and seemed eager to apply the torch at once. Early the next morning they burned one of the hotels. Next day Col. Akins residence was burned. On the 24th Wheelers cavalry made a raid on a wagon train near Cassville and captured a number of prisoners, wagons, mules, etc. Orders were repeatedly issued for the citizens to leave, and the utter destruction of the place was threatened; but the threats were not executed till October 12th, when the male college and several private residences were burned. The male college was burned by a detachment of Wilders brigade composed of parts of the 98th Illinois, 1st, 3rd & 4th Ohio regiments and on the 5th of November Col. Heath of the 5th Ohio came with about three hundred cavalrymen and completed the destruction which left many poor women and children without shelter from the storms of winter which were fast approaching. The morning was bright and clear, but in the evening the smoke arose and formed a dark and threatening clouds, which for a while suspended over the doomed spot and then seemed to melt away in the tears of grief. It seemed as if nature was weeping over the sad fate of old Cassville.